We are Kath and Babs, a 30-ish couple from Belgium addicted to traveling the world. Ever since we met (more than 14 years ago!) we’ve been exploring the most beautiful parts of the earth together. The highlight of those travels was a 6-month trip from Brazil down to Patagonia and all the way up to Ecuador and the Galapagos Islands. But we’ve ventured through Europe, Sri Lanka and Thailand as well! 3 years ago, we welcomed N., our Little Crazy Elf, into our life. And thus we became mums! 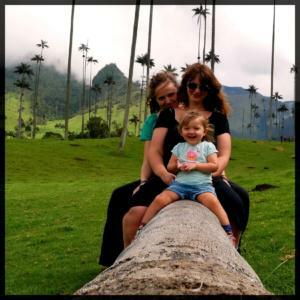 A lot of people give up on longterm and far-away traveling when they’re having a baby, but we firmly believe that by doing these kind of trips we’re both tightening our bond as a family and creating wonderful lifelong memories. I am Babs (or Barbara if you’d like to use my full name) and I am the main writer of this site. Ever since I was little I’ve been traveling with my family, thus planting the seeds for my travel addiction. I was really fortunate to meet Kath at such a young age so we could set out and explore the world together. Apart from my obvious passion for travels, I love reading, blogging and writing as well. Whenever the sun is shining I feel like I’m on top of the world. So yes, I prefer countries with a lot of sunshine! Up until a year ago, I was a teacher, teaching Dutch as a second language to adults. A very interesting and rewarding job, that’s for sure. But I wanted more. I wanted to set out and explore whenever we feel like it, so I quit my job and became a full-time travel blogger. But then we decided to build a house. Ourselves. So, with a toddler and the construction of our house, there wasn’t too much occasion for blogging. However, we’ve been living in our new place since January 2019 and so yes, I’ve been working really hard on this blog since then. This is Kathelijn, but about half of the time she’s known as Kath. Though she doesn’t have such a writing bug, I firmly believe she is the one who is going to make this blog big, because whenever she puts her heart into something, she will do everything to make it work. Ever since we’ve met, she’s been craving to see the world and loved all the adventures we’ve been on. She is a big fan of slow travel, especially now with N., giving ourselves time to really get to know a place. She has been working at the office of her dad for the last 8 years, but in reality, all she ever wanted to do was working with her hands. Give her a piece of wood and she can make the most beautiful things! Kath is also the kind of person to give everything for the people she loves (N and me are so lucky!) and she has such a great sense of rightfulness. She’d love to fight for the whales on the Rainbow Warrior, but since that is rather difficult with a little one, she is constantly seeking for other places where we can help. N was born in November 2015 and has filled our lives with joy from the second she was born (and even before that!). She is such a caring little human being, for humans and animals alike. She loves to travel the world with us, making friends and swimming in pools wherever we go. However, she does not like to be touched by strangers (which can be rather difficult, especially in places where little kids with blondish hair and blue eyes aren’t common) and she’s the only one in our family that doesn’t mind going to cold(er) places. We love to explore little cities, meander through streets and watch the sun set in a new place. We enjoy the feeling we get when arriving somewhere new and trying to get the feel of the surroundings. Working out where the supermarket is and the most convenient route to get there. What we like even more than traveling, is traveling with a child. It’s rather obvious that you won’t be doing the same things as you would have before, the same way your life isn’t the same anymore. Of course there will be difficult times and tantrums, just like at home. BUT you get to show your little one(s) the most wonderful things and you get to be around them way more than at home. It’s also amazing what a conversationstarter a child is. We also love the memories we are creating both with an for our daughter. And we do believe that this is going to shape her personality, make her open and understanding to different cultures, beliefs and people in general.